SHENZHEN, China, Oct. 8, 2018 /PRNewswire/ — Absen, a leading global LED provider, recently launched PL Lite, a new generation of rental product for indoor and outdoor applications. 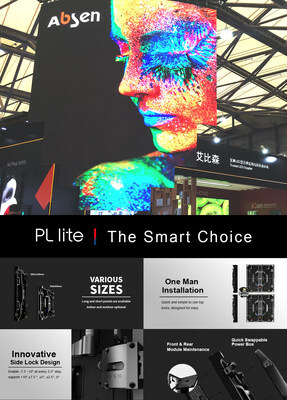 The PL Lite was first unveiled at LED China, the world’s preeminent LED exhibition, where visitors had the opportunity to experience the product first-hand, and which resulted in orders of over 2,000 sqm from visitors to the Absen booth. Engineered to deliver the best balance of visual performance, ease of use, flexibility and reliability with an excellent price-to-performance ratio, PL Lite is available in four pixel pitches: 2.5, 2.9, 3.9 and 4.8. The PL Lite is currently available in APAC and Latin America. Designed for simple operation, the PL Lite series features 9kg-12.5kg lightweight panels and an industry-leading vertical auto-lock system, enabling a quick and easy installation, regardless of screen size. This mechanical advance is coupled with the unique Platform design, meaning modules, components and accessories for all available pixel pitch products can be used on the same frame, and customers do not need to stock all types, reducing cost. PL Lite also features front and rear service, and has a quick swappable power box, allowing tool-free service in seconds. To meet the requirement of design flexibilities, Absen developed a proprietary Side-Lock curve system. PL Lite provides -7.5 to +10 degrees curve, hanging bars and the Universal Stacking System, in addition to the lightweight panels. Optimized for extra-large outdoor LED display applications, it features a variant panel of 500*1000mm for P3.9 and P4.8, twice the standard size of 500mm*500mm but 20% lighter than conventional panels. Absen PL Lite boasts a 110% NTSC color gamut and more than 7000:1 high contrast and delivers extraordinary visual performance. Adopting a robust new cabinet frame with IP65/54 water-proof design and special edge protection, it is a perfect all-weather rental solution for a wide range of applications from outdoor concert touring and festivals to corporate events, car shows, government activities, summits and exhibition stands. Absen is an award-winning provider of LED display solutions, which are used for a wide range of indoor, outdoor and rental applications. As the number 1 exporter of LED displays in China for nine consecutive years, Absen’s products are deployed in over 120 countries around the world.